The Amateur Archaeologist in the Great Basin provides a means of bridging the ever-shrinking divide between professional archaeologists and the interested public. Professional archaeologists are becoming increasingly aware of the public's enthusiasm toward archaeology, and, more importantly, they are realizing an obligation to interact with all segments of the public including school children, expanding legions of retirees, and contemporary Native Americans. Indeed the public has much to offer, and Len Ettinger's book will hopefully channel the reader's efforts towards fruitful cooperation between informed amateurs and the professional archaeological community. Chapters include The History of Archaeological Research in the Great Basin, Man's Entry into North America, The Great Basin, Man's Entry into and Occupation of the Great Basin, Archaeological Sites, Weapons and tools, Amateur Archaeology, and Archaeological Law. Soft cover, 6" x 9", 116 pages. There are hundreds of collecting localities described in this field guide to the gem and mineral localities of the Mojave and Colorado Deserts in California. Desert Gem Trails is profusely illustrated with detailed maps and provides concise road logs and directions to collecting spots. The author details what types of specimens and rough are found and what types of tools and equipment are required to collect them. Information regarding road conditions, camping and nearby points of interest is also provided. Soft cover, 5.5" x 8.5", 80 pages. Arizona is known the world over for the abundance and variety of its geological treasures. In a landscape as diverse as the minerals themselves, this rich trove of gemstones can be found in sites ranging from arid desert to pine-covered peaks. Newly revised, the fourth edition of this best-selling guide contains the latest updates on the familiar sites and features twenty new locations for collecting rocks, minerals, crystals, and fossils, more than 900 collection sites in all! Gem Trails of Arizona features detailed text describing where to go and what to look for at each site, maps for each site pinpointing the best supplies of specimens, photographs depicting the collecting areas, a new glossary to help you identify your finds, and a full color photographic portfolio of spectacular Arizona gems. Filled with expert advice based on years of experience, Gem Trails of Arizona is an indispensable handbook for the rockhound who is just starting to explore the wealth of this colorful state. The seasoned collector too will find this an invaluable reference. Soft cover, 6" x 9", 223 pages. There is jade, often occurring in qualities rivaling that from Wyoming or Burma; beautiful pink rhodenite, as fine as can be found anywhere; and the most diverse variety of gem obsidian in the entire country, if not the world. Weekend prospectors can even pan successfully for gold in the legendary gold rush country. Detailed text and maps lead the rockhound to beautiful scenery and fascinating rocks and minerals. Full-color photos of specimens found at the end of the gem trail make identification easy. Black and white photos help locate collecting sites that include pine covered mountains, barren desert and beautiful beaches. From popular and commercial sites to those little known, out of the way places, this is the most complete guide to gem, fossil and mineral collecting in Northern California. Soft cover, 6" x 9", 160 pages. From sandy beaches to desert landscapes, this revised edition is the definitive guide to collecting sites throughout Southern California. For agate to zoisite, find out where to search and find the best specimens that the area has to offer. Taking up where Gem Trails of Northern California left off, this companion book introduces 14 new sites and covers all of Southern California from just north of San Luis Obispo south to the Mexican border and all site points in between. Detailed maps and descriptive text lead the rockhound to over 82 of the best collecting locales for gems, minerals and fossils. Numerous black and white photos aid in locating the collecting area and selective color photos help with specimen identification. Includes a handy mineral locator index, glossary and helpful contact information lists. Full of helpful hints for getting the most out of each site, the author becomes your personal tour guide to the many treasures that Southern California has to offer. Ideal for the novice and an important addition to any experienced rockhound's collection, Gem Trails of Southern California is a must for any rock collector exploring this diverse region. Soft cover, 6" x 9", 215 pages. Discover beautiful blue-green amazonite crystals, vivid pink rhodochrosite, petrified wood and dinosaur bone as well as numerous other rocks, minerals and fossils as you explore the scenic state of Colorado. This indispensable guide provides clear maps, concise directions, detailed text and numerous black and white photos on a wide variety of more than 75 collecting sites throughout the state. A section of color photographs aid in identifying the rocks and minerals found at the end of the gem trail. From old abandoned mines to road cuts along busy highways, from remote collecting areas to fee mining locations with all the modern amenities, there is something for the amateur and experienced gem hunter alike within the pages of this updated edition of Gem Trails of Colorado. soft cover, 6" x 9", 144 pages. Completely revised and updated with 28 new sites, Gem Trails of Nevada is the collector's guide to over 75 of the best gem, fossil and mineral collecting areas the Silver State has to offer. From opal mines and mountain passes to abandoned ghost mining towns and parched deserts, the extensive landscape and mineral wealth of Nevada is still out there for the avid gem and mineral collector. Find out where to look, what to look for, what to bring, how to get there and what you can expect to find. And along the way you can expect to enjoy some of the natural wonders and earthly treasures that only Nevada has to offer. Sites are divided into four geographical regions and are presented with directions, rockhounding tips, descriptive text, updated highway and site maps, and numerous black and white photos. Also included are a handy mineral locator index, a glossary, lists of museums, rock clubs, government agencies and a full-color insert of rock, fossil and mineral specimens found within Nevada's prolific borders. More than 75 locations throughout the state. Soft cover, 6" x 9", 192 pages. New Mexico is a rockhound's paradise - 122,000 square miles, some mountainous and forested, but much of it is arid with little vegetation. Large amounts of public land are available for collecting. From micro mount and gem quality mineral specimens, to fossil pieces containing life forms that are millions of years old, there is something of interest to both the novice and experienced collector. Divided into four geographical regions, detailed maps, driving directions, descriptive text and helpful rockhounding tips lead collectors from the geologic wonderland of Bisti to the unbelievable variety of collectibles at the Rockhound State Park. New Mexico's extensive landscape and mineral wealth are highlighted here in color as well as black and white photographs. This latest fully revised edition of a classic, best-selling rockhound guide adds 34 new sites, updates the old ones, and details the finest rock, mineral and gem sites "The Land of Enchantment" has to offer. More than 100 locations throughout the state. Soft cover, 6" x 9", 239 pages. From agate to zeolite, this definitive guide to collecting sites throughout Oregon highlights the natural treasures of the state. Oregon's varied terrain, including coastal beaches, pine-covered mountains, and barren desert, offers rockhounds the promise of memorable collecting experiences and outstanding mineral specimens. This completely revised edition reflects numerous changes. Twenty-five completely new locations containing 40 collecting sites have been added. Detailed maps and descriptive text accompanied by black-and-white photos lead collectors to more than 80 of the best sites for finding gems, minerals and fossils. A new insert of vivid color photos aids with specimen identification. Whether amateur or experience, gem and fossil hunters will find much of interest within the pages of the revised Gem Trails of Oregon. Soft cover, 6" x 9", 193 pages. Newly revised and updated, Gem Trails of Pennsylvania and New Jersey is the essential guide for veteran and new collectors alike. Follow gem trails to beautiful agate, jasper, galena, pyrite, quartz crystals, fossils, and much more! The authors become your personal guides to unearthing the beautiful geologic treasures found throughout the best sites in Pennsylvania and New Jersey. Sites are presented with directions, rockhounding tips, descriptive text, maps and numerous black-and-white photos. Rocks, minerals and fossils found at the ends of the gem trails are pictured in full color to aid in identification. From seaside beaches to overgrown quarries, explore old favorites as well as newly-discovered sites that hold a wide variety of specimens for the rockhound to uncover. Soft cover, 6" x 9", 167 pages. Completely revised and updated, Gem Trails of Texas is the classic guide to over 50 of the best rockhounding sites the Lone Star State has to offer. Sites are presented with directions, rockhounding tips, descriptive text, updated maps and numerous black and white photos. Divided into six geographical regions, which include convenient introductions to each area and a site locator map, this field guide also contains: a handy mineral locator index; glossary; lists of museums and gem and mineral societies; and a beautiful full-color insert of rock, fossil and mineral specimens found along the gem trails. From rolling green hills and rocky mountains to lake beaches and southwestern ranches, this book will tell you where to look, what to look for, what to bring, how to get there and what you can expect to find. Whether you are an amateur or experienced rockhound, Gem Trails of Texas is the essential guide to finding quality rock, fossil, mineral and gem sites throughout Texas. Soft cover, 6" x 9", 167 pages. Welcome to rockhounding in Utah! You'll find many unique opportunities in a landscape as diverse as the gems, minerals, and fossils found here. There are trunks of petrified wood, faceting grade labradorite, topaz crystals of a color and clarity that rival any found anywhere, boulders of obsidian, delicate halite crystals and much, much more. Detailed text and maps lead the gem hunter to abandoned mine dumps, stunning desert terrain, deep canyons, pristine mountains and beautiful lakes in the search for specimens. Black and white photos highlight the collecting area. A color section aids in specimen identification. This latest edition of a classic, best-selling guide is invaluable for the rockhounds just starting out, filled with expert advice and years of experience. For the collector who has been discovering Utah's treasures for years, it is an outstanding source of the old and the new sites in one handy volume. More than 75 locations throughout the state. Soft cover, 6" x 9", 168 pages. Looking for and finding gold is not an easy, comfortable, home type recreation. It is hard work, but it will get you out-of-doors and reward you with invigorating adventure-filled outings and escapades. It will stir and awaken the dormant pioneer blood that is inherent in most of us. Contents include: How it Started, The Charisma of Gold, The Distinctive Behavior of gold, Reading & Working the River, What You Need to Begin, Panning for Beginners, Mini-Portable Sluice box, Using Your sluice, Separating Gold from Sand, Making Gold Jewelry, Gold Panner's Mining Terms and Where to Find It. Soft cover, 5.5" x 8.5", 80 pages. Anyone can use a pan to recover gold from mountain streams, desert arroyos or wherever it awaits you. Roy Lagal, who has spent a lifetime finding gold, tells just how easy it is. Take your next vacation in beautiful gold country. Follow the simple illustrated instructions in this book and use Roy's "Gravity Trap" gold pan. You are certain to enjoy the glorious outdoors. And, you may experience the thrill of a lifetime as you find color of your very own! Also, learn how to use metal detectors that can make discovering gold nuggets as easy as finding coins in the park. Contents include Gold...Why Search for It, Searching...Where Gold is Located, Panning...Just How it Works, Gold Pans...What They're Made Of, Wet Panning...How to Find Gold, Dry Panning...How to Find Gold, Gold Pan Kit...Short Cut to Success, Pan & Detector...Gold-Finding Combination, Finding Gold...With a Metal Detector, Recovering Gold...With a Metal Detector, Identification...Of Metal/Mineral Samples, Gold Dredging...Made Easy for Beginners, and Conclusion...Gold is Where You Find It. Also included is a glossary of panning and prospecting terms and an appendix of information sources. Soft cover, 5.5" x 8.5", 134 pages. Rock and gem collecting the GPS way! Maps and compasses have been the standard for locating collecting sites for decades, but now there is an alternative way to find your destination - The GPS Guide to Western Gem Trails. Compiled by a veteran rockhound, this handy supplemental GPS guide directs you to the best collecting sites found in the Gem Trails book series as well as other popular rockhounding guides for Arizona, California, Colorado, Idaho, Montana, Nevada, New Mexico, Oregon, Utah, Washington and Wyoming. Beginning with an introduction and a highway map for each state, the north latitude, west longitude, DeLorme map page, section/township/range, 7.5 minute quadrangle sheet and jurisdiction are provided for each site. A major waypoints section is also included for major cities, junctions and sites with county, latitude and longitude listed. Lists of national parks and monuments, places of special interest, government agencies contact information and a helpful site index make this an indispensable tool for GPS users. With over 1,200 locations to chose from, The GPS Guide to Western Gem Trails is a reliable location tool to complement the guidebook collection of every serious rock and fossil collector. Soft cover, 6" x 9", 239 pages. A classic guide to collecting in Minnesota, Wisconsin, Indiana, Illinois, Michigan and Ohio since 1955, Midwest Gem, Fossil and Mineral Trails - Great Lakes States has been revised and updated. Geologically the Midwest is an incredible land carved by glaciers and situated on the incomparable Great Lakes, the location of the upper Mississippi River Valley and the Ohio River. The copper country of Michigan, the iron ranges of Minnesota, the fluorite area of Illinois, and the limestones of Indiana are unsurpassed. Wisconsin holds great promise for copper, lead, and zinc, and it's granite is a national favorite. Ohio, a leading coal producer, has yielded some of the finest fossils ever found. Diamonds and gold have been found here too; the reserves of minerals are tremendous. There are miles of beaches on the Great Lakes and other glacial lakes, along reservoirs, and along the rivers and streams of this region where Lake Superior agates, fossils, and minerals can be found. The author, who has been collecting in these states for over 50 years, describes how to hunt your own, where and what to collect, and where to find additional information on each state. An indispensable guide for the rock hobbyist, lapidary and fossil enthusiast, this book highlights the best of each area in one compact volume. Soft cover, 5.5" x 8.5", 128 pages. First published in 1955, Midwest Gem, Fossil and Mineral Trails - Prairie States is an indispensable guide for any rockhound collecting in South Dakota, North Dakota, Nebraska, Iowa, Kansas or Missouri. For the rock hobbyist, lapidary and fossil enthusiast these states have much to offer, Lake Superior agates are widespread. Magnificent fossils occur in each state. superb crystals of quartz, calcite, pyrite, marcasite, dolomite, celestite, selenite, sphalerite, and barite are not difficult to come by. There are also numerous rare minerals which provide an extra thrill for the field collector. This updated edition describes where and what to collect, how to hunt on your own, and where to get more information and additional help in each state. Helpful hints for collecting minerals, gem materials, and invertebrate fossils are highlighted by an author who has collected in these states for over 50 years. An essential guide for the beginning and experienced collector alike, Midwest Gem, Fossil and Mineral Trails - Prairie States, highlights the best of the region in one handy volume. Soft cover, 5.5" x 8.5", 127 pages. Whether you're digging for the first time or are an experienced rockhound or "prospector," with a simple rock hammer and a little luck, you too can strike it rich... or at the very least have fun trying. This guide offers you easy-to-use information on the ins and outs of "fee dig" mining in the Northeast United States, complete with locations, costs, tips on technique, entertaining legends and important information on everything from safety kits to the location of the nearest rest rooms. Included are resources for identifying your finds, having them made into jewelry, and further pursuing an exciting - and possibly profitable - hobby. Covers Connecticut, Delaware, District of Columbia, Indiana, Illinois, Maine, Massachusetts, Maryland, Michigan, New Hampshire, New Jersey, New York, Ohio, Pennsylvania, Rhode Island, Vermont, and Wisconsin. Soft cover, 6" x 9", 189 pages. Whether you're digging for the first time or are an experienced rockhound or "prospector," with a simple rock hammer and a little luck, you too can strike it rich... or at the very least have fun trying. This guide offers you easy-to-use information on the ins and outs of "fee dig" mining in the Northeast United States, complete with locations, costs, tips on technique, entertaining legends and important information on everything from safety kits to the location of the nearest rest rooms. Included are resources for identifying your finds, having them made into jewelry, and further pursuing an exciting - and possibly profitable - hobby. Covers Alaska, Idaho, Iowa, Minnesota, Montana, Nebraska, North Dakota, Oregon, South Dakota, Washington and Wyoming. Soft cover, 6" x 9", 157 pages. Here are forests of petrified wood, veins of brilliant turquoise, and troves of facet grade garnet, peridot, and amethyst - in all more than 640 mineral species that make Arizona a rockhound's paradise. In Rockhounding Arizona expert rockhound Gerry Blair describes more than seventy of the state's best rockhounding areas, from jasper hunting in the historic mining district near Bagdad to searching for gold in the Superstition Mountains and digging for turquoise at the foot of the Hieroglyphic Range. This guidebook covers popular and commercial sites as well as numerous little-known sites. It also describes where to view mineral specimens and prehistoric artifacts at Grand Canyon and Petrified Forest national parks, as well as on tribal lands. Brimming with advice on collecting and preparing gems and minerals, this handy book also includes maps and directions to museums, rock shops, and major public land areas. For the beginner, Rockhounding Arizona offers a complete introduction to this many-faceted hobby. For the expert, it is an outstanding guide and source book. Beyond the possibility of making a new find or valuable discovery, rock and mineral collecting is an inexpensive hobby that is an excellent activity for all ages. It also offers the opportunity to explore landscapes as diverse as the rocks and minerals found there. Within the pages of this well illustrated guide you will learn how rocks and minerals are formed, discover what to look for in the field, decide on the best tools for the job, prepare for successful field trips, identify commonly encountered gems and minerals, preserve and prepare specimens, and explore the basic aspects of lapidary. Written by an author of numerous gem trail books, The Rockhound's Handbook is an indispensable how-to book for the beginner, and a handy reference guide for the experienced collector. Soft cover, 6" x 9", 184 pages. Whether you're digging for the first time or are an experienced rockhound or "prospector," with a simple rock hammer and a little luck, you too can strike it rich... or at the very least have fun trying. This guide offers you easy-to-use information on the ins and outs of "fee dig" mining in the Northeast United States, complete with locations, costs, tips on technique, entertaining legends and important information on everything from safety kits to the location of the nearest rest rooms. Included are resources for identifying your finds, having them made into jewelry, and further pursuing an exciting - and possibly profitable - hobby. Covers Alabama, Arkansas, Florida, Georgia, Kentucky, Louisiana, Mississippi, Missouri, North Carolina, South Carolina, Tennessee, Virginia, and West Virginia. Soft cover, 6" x 9", 179 pages. Whether you're digging for the first time or are an experienced rockhound or "prospector," with a simple rock hammer and a little luck, you too can strike it rich... or at the very least, have fun trying. This guide offers you easy to use information on the ins and outs of "fee dig" mining, complete with locations, costs, tips on technique, entertaining legends and important information on everything from safety kits to the location of the nearest restrooms. Included are resources for use in identifying your finds, having them made into jewelry, and further pursuing an exciting and possibly profitable hobby. Contents include equipment and safety precautions, mining techniques, notes on gem faceting, cabbing and mounting services, annual events, state gem and mineral symbols, finding your own birthstone, finding your anniversary stone, finding your zodiac stone and state listings for collecting sites in Arizona, California, Colorado, Hawaii, Kansas, Nevada, New Mexico, Oklahoma, Texas and Utah. Soft cover, 6" x 9", 185 pages. Like gold, gemstone is where you find it. For every ounce of quality material there are many tons of common rock. A rockhound could spend a lifetime of fruitless searching without leads to show the way, so that is the purpose of Coast to Coast Gem Atlas. Over a period of years the authors have noted and compiled every gem location known to them. Many of the localities shown on the maps in this book have been publicized before and some have been worked over quite thoroughly. However, most new finds are made in the same general areas. We just have to search a little further or dig a little deeper. 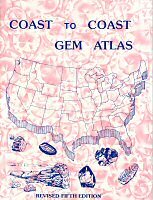 This collecting guide contains maps designating collecting areas for various types of gemstones and fossils covering locations throughout the contiguous 48 states. Covered are Washington, Idaho, Montana, North Dakota, Minnesota, Wisconsin, Michigan, Ontario, New York, Maine, Oregon, Wyoming, South Dakota, Indiana, Ohio, Pennsylvania, New York, New Jersey, Massachusetts, California, Nevada, Utah, Colorado, Kansas, Missouri, Illinois, Arkansas, Tennessee, Kentucky, Virginia, West Virginia, Maryland, North Carolina, Arizona, New Mexico, Texas, Oklahoma, Louisiana, Mississippi, Alabama, Georgia and Florida. Soft cover, 8.5" x 11", 60 pages. Like gold, gemstone is where you find it. For every ounce of quality material there are many tons of common rock. A rockhound could spend a lifetime of fruitless searching without leads to show the way, so that is the purpose of Western Gem Hunter's Atlas. Over a period of years the authors have noted and compiled every gem location known to them. Many of the localities shown on the maps in this book have been publicized before and some have been worked over quite thoroughly. However, most new finds are made in the same general areas. We just have to search a little further or dig a little deeper. This collecting guide contains maps designating collecting areas for various types of gemstones and fossils covering locations from California to the Dakotas and British Columbia to Texas. All of the states north, south and west of Kansas are represented, along with British Columbia and Alberta in Canada. Soft cover, 6" x 9", 79 pages.